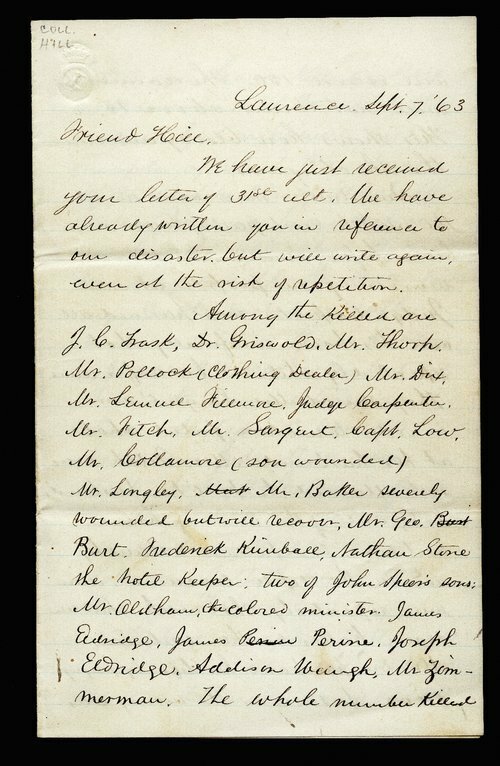 H.M. Simpson, of the Banking House of Simpsons Brothers in Lawrence, Kansas, wrote this letter to Hiram Hill of Massachusetts that provides many details concerning the number of dead and the extent of the destruction caused by Quantrill and his men during their August 21, 1863, raid on Lawrence. Chillingly, the letter vividly details how several of the victims of the attack met their end at the hands of Quantrill's raiders, including one man who paid the attackers $1,000 to spare his life, only to be shot and killed immediately after he turned the money over. H.M. Simpson's letter to Hiram Hill offers an excellent first-hand account of Quantrill's raid on Lawrence and it helps the students understand the scale and violence of the raid.